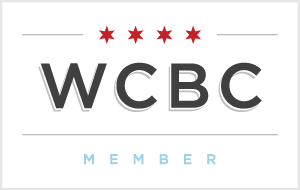 Since starting IHABL I haven’t done nearly as many restaurant reviews as I’ve wanted to. Truth be told (and don’t tell my bank), but I go out to eat so much that by the time I’m ready to sit down and rave about a restauarnt, I’m oftentimes headed out the door to try another and become equally enthralled. (Sidenote: in high school my English teacher would take points off if you used certain “taboo words” — and oftentimes was one of them. To this day my heart skips a beat when I write out any of those words, as if something bad is going to happen because of it). Anyway, this past Sunday my parents ventured into the city to bring me some final touches for my apartment. I’ve been wanting to take them to some of the cool restaurants in my neighborhood so I was excited when they agreed to go out to dinner with me (*cough cough* pay for dinner *cough cough*). Eating with my family can be tricky: my mom doesn’t eat meat, I don’t eat red meat, my brother basically eats meat exclusively, and my dad will eat anything as long as a green vegetable isn’t within arms length. When I heard that my brother, god love him, wouldn’t be coming along, I jumped at the chance to take them to Fahlstrom’s Fresh Fish Market. Fahlstrom’s is a restaurant that doubles as a fish market, so you can simply stop by, choose from 16 pieces of fresh fish daily, and prepare it at home yourself if you don’t feel like eating like a king and then having someone else clean up after you. The restaurant prides itself on a few things: 16 pieces of fresh fish to choose from daily (ever-changing based on season and availability), the cereal wall, breakfast anytime, and all-you-can-eat crab legs on Tuesdays. Oh, and The Crabster, but more on that later. After another few minutes of looking over the menu, my parents and I decided to order three dishes and split them, as I have a serious case of Food FOMO and I think they could see the blips of sweat rolling down my face as I worried I was going to make the wrong decision. First we went with The Crabster, one of the specialties at Fahlstrom’s and, in the words of our server, “what people come here for.” Hand-shucked and seasoned Alaskan King Crab on a toasted New England roll topped with creamy coleslaw. 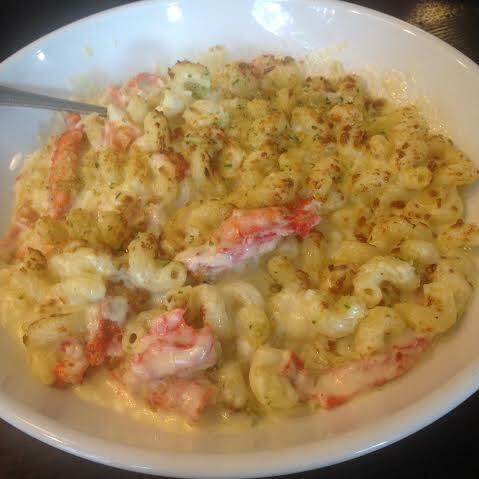 Second up, the Alaskan King Crab Macaroni and Cheese. Crab, Gruyere cheese sauce…married and baked. Finally, the Seafood Bisque Fettuccine. Filled to the brim with shrimp, scallops, fairy dust and magic. I only wish I stopped by for a later dinner so I could have enjoyed all these incredible eats with a glass of white wine. 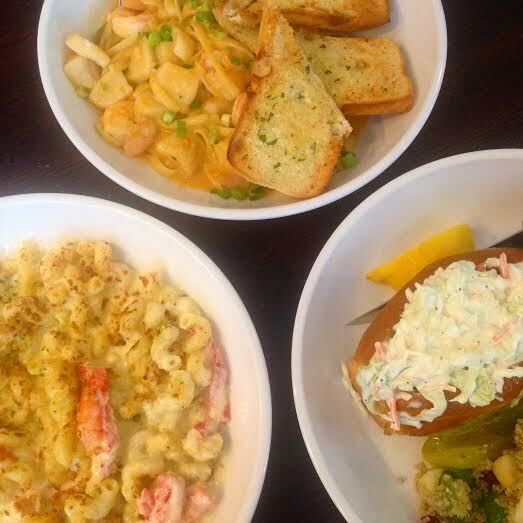 Until next time, Fahlstrom’s…..oh, and what’s the likelihood that you’ll deliver crab mac directly to my couch…..
Oh my gosh, you have me totally craving seafood right now. Living so close to the coast you’d think there were a million seafood restaurants in Williamsburg, but there are only a couple I like. That place looks awesome! Be still my seafood lovin’ heart! Do they deliver to Georgia? I NEED that mac and cheese! I’m not even usually a seafood lover but it looks so good I don’t think I’d even care! YUM. That place looks amazing! I always try to go to seafood places, but 16 pieces of fish! It sounds heavenly! It was to die for — so many choices and every single one that we tried was a hit. This looks amazing. I can’t bring Neil here or he will buy all the most expensive fish bc we NEED TO HAVE THEM. They sell pre-cleaned, raw BEAUTIFUL shrimp for $11-$12 a POUND. It’s absurd. It’s a hidden gem. What an eclectic place! 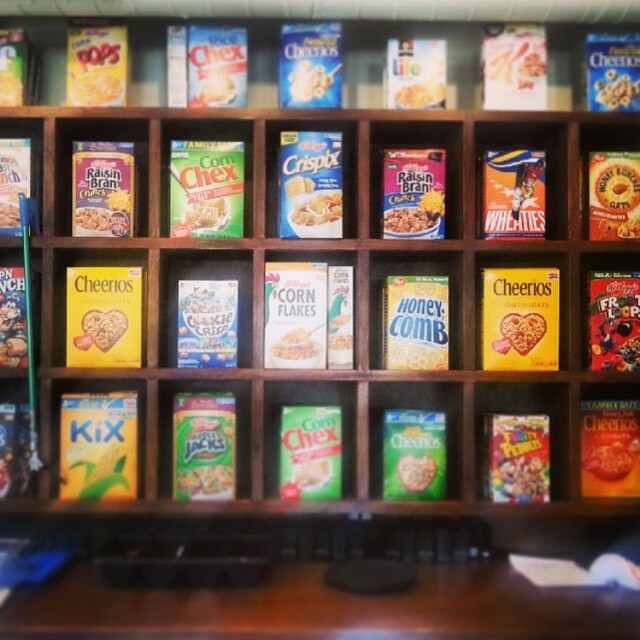 I’ve gone past there a couple of times, and I never would’ve thought you could get cereal inside a fish market haha. I also didn’t realize it was a fish market AND seafood restaurant. Everything about this place sounds ah-mazing. There are so many cool quirks about this place! It’s definitely worth stopping by. Best seafood I’ve had for a long time — every single thing was a hit. Oh my life… These dishes couldn’t be further from what I normally eat… Yet I want them soooo bad. Also cheese is life so pairing those with creamy meaty fish…. Major drool! Oh and I had to laugh with ‘oftentimes’ – I genuinely have never heard of that as a word before! Haha! Unfortunately I’ve been eating like this WAY too often. I need some of your discipline!! My brother told me all about this place. I NEED to check it out! Absolutely. It was a hit all around! How come oftentimes is taboo? I totally never got taught that haha! To be it sounds super legit! 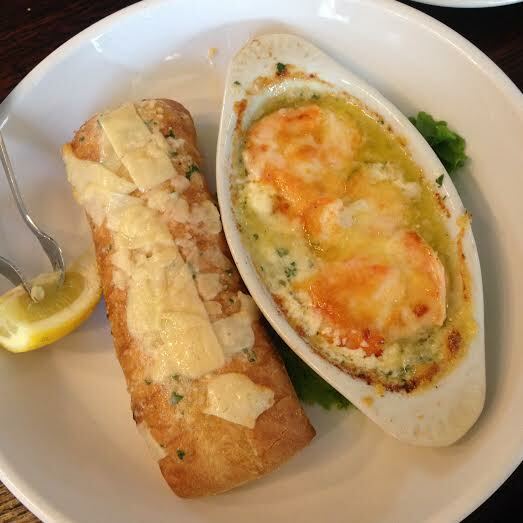 Garlic butter and garlic bread… Ummm YES PLEASE! I work at a French restaurant so yeah I am pretty much a big fan of garlicky sauce haha. Hahaha garlic and butter is a French classic — makes me think of escargot! Now I want it! omg. This is legit my kind of place. Omg sweet baby jeebuz that garlic hot tub. I’d frigging BATHE in that stuff. SAME. It would be so good for the skin too, I think. It’s clearly a healthy decision. Oh man… you had me at hot tub of garlic!!! amazing! I think I need to trademark “garlic butter hot tub” — it’s blowing up! That looks amazing. I thought i liked seafood before moving to SoCal, now I’m flat out addicted. And that garlic tub… whoa. I’m seriously considering moving to SoCal JUST for the seafood. Please tell me it’s not overrated! Not overrated in the least! It’s like food heaven here. I’m not a seafood lover, but this makes me want to go get a crabster. Like now. I feel like if you’re ever going to like seafood you would like it here. You can put butter, garlic, and cheese on anything and it would be killer!